I’m nearing the end on Gamaldags, and being me, I couldn’t help but make some small tweaks to the pattern. 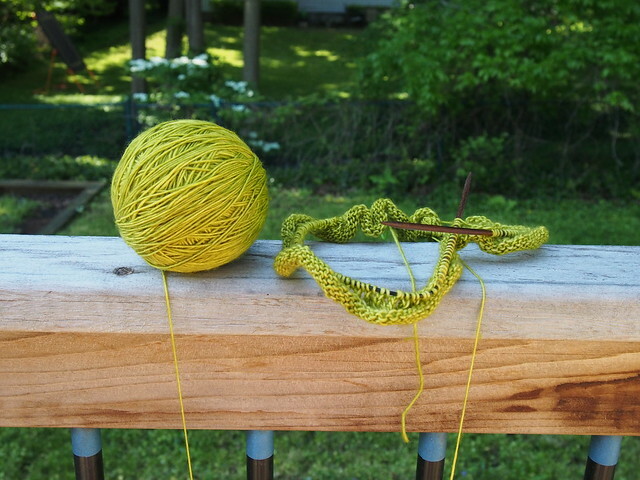 I decided to add an extra short row in the green and yellow stripe section, because I really, really don’t like it when the back of my sweater droops, or when the front of my sweater doesn’t scoop quite enough. And instead of the 2×2 rib called for in the pattern, I knit a 1×1 folded neckband, because I just love them ever so much. 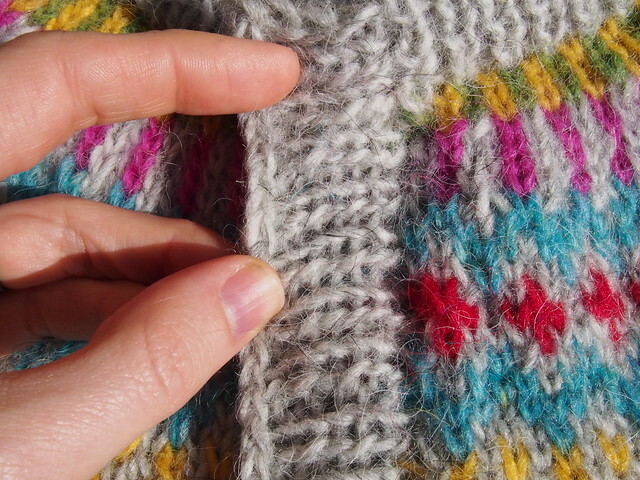 I also did the button band in 1×1 rib rather than 2×2, and I finished it with a 2-stitch i-cord bind off (this is the same approach I took to the button bands on M’s Peg cardigan). I still need to pick up the stitches on the other side, the one that will have the button holes in it, but other than that (and a lot of end-weaving, and blocking, and of course, STEEKING! ), I’m almost done! The yarn is some MadTosh Merino Light from my stash, because I’m now in a very committed “knit down the stash” phase. Moving put me face-to-face with the absurd amount of yarn that I already have, and paying two mortgages (not for much longer – we’re almost to closing on Old House!) has blown up our budget, so…no new yarns for me, for quite a while. The only, and I mean ONLY, exception that I’ll make is that if buying a tiny amount of yarn will enable me to make a project that will use a LOT of the yarn I already have, then that’s a net reduction and I’ll do it…but I also want to see how creative I can be in terms of finding or designing patterns to use what I’ve got. This has me thinking a lot about my identity as a knitter and a designer. 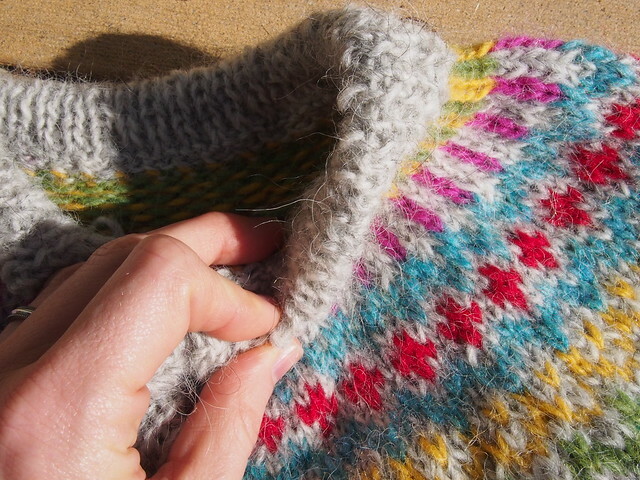 I’ve been going back and forth on whether to submit anything to the latest call for designs for Wool People. 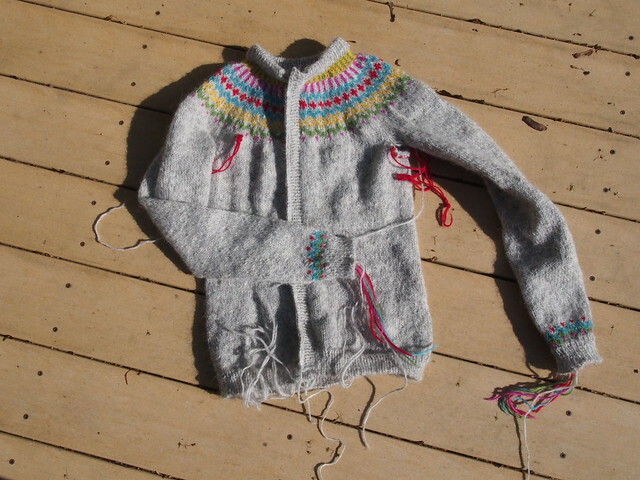 For those who haven’t been reading this blog for very long, I had a design in the very first Wool People, which ended up also being the last pattern I published, because it turned out for me that motherhood, finishing a Ph.D., and then starting a new faculty position just didn’t leave any time or energy for being a designer. I’m still spread pretty thin, and am not at all sure I can really manage adding another gig to my life. Along with the mountain of projects I can and want to make from the yarn I already have, that makes me lean towards not bothering to submit. But I do have design ideas (some that I’ve already knit variants of in other yarns) that I think would fit well given the mood boards that were sent out and that would look great in BT yarns, which makes me want to put together a submission. I don’t have a ton of time to decide, in any case, because the submissions are due in just over a week. I also still have a collection of “parent-child” knits bubbling in my brain (and in fact, have already knit versions of many of these, too), and still don’t know what to do with them, either. The creative designer part of my brain is still there. But I’m just not sure how getting back into designing would fit alongside trying to knit from stash; most people aren’t going to be eager to buy a pattern for something knit with discontinued yarn, you know? Will getting creative with knitting down my stash be enough to satisfy my creative mind? I don’t know. I assume there’s a test knitting phase when you’re doing a design for publication, so maybe your stipulation for test knitting could be that it be done in a currently available yarn? That way, even if you design it with something not available, at least there will be some sort of available yarn attached to the design? That said, personally, I don’t usually focus too hard on what a design was designed in, and almost always end up using something else entirely. No idea if that’s super common or I’m an outlier, but I personally don’t much care what yarn a designer used or whether it’s available to me, because I will almost certainly not knit whatever it is with the same yarn. The sweater is looking great!